and we at Medals UK certainly think that is true. I guess ordinarily when you think about medals and trophies the first thing that comes to mind are sporting achievements, but we have produced so much more over the years we thought we’d take this opportunity to share some of our favourite and most rewarding products with you. 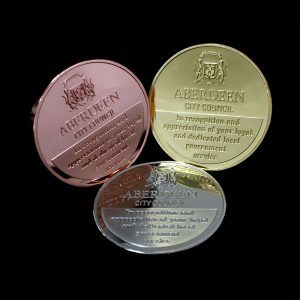 One hundred years’ service is no mean feat, but that’s exactly what Aberdeen City Council could celebrate with the three types of commemorative coins we produced for them. The beautifully crafted coins were created as long-service awards for their dedicated employees who had worked for 25, 35 and 40 years. Just presenting one of each coin to individuals represents 100 years service for the city council, a monumental achievement for both the employees, but also for the Council who clearly recognise and value their staff. 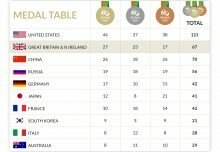 We think the gold, silver and bronze commemorative coins are certainly a fitting tribute to these significant milestones. 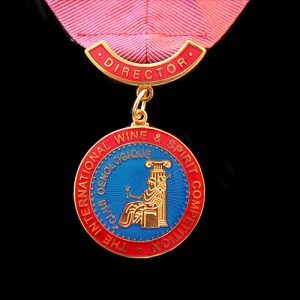 Now this is a purely personal choice, but we couldn’t showcase some of our outstanding products without highlighting the medals we’ve produced over the years for the International Wine and Spirits Competition. We’ve worked with the IWSC since 2006, producing Directors Medals and Competition Awards and it’s an event that we certainly look forward to every year as we make it our aim to sample as many of the winners’ products every November as possible! 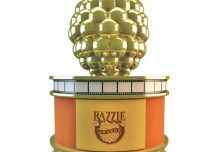 The Awards continue to go from strength to strength in stature and attract producers from around the world to showcase the very best in wine and spirits. 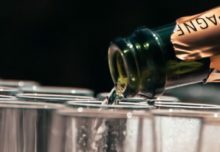 Last year’s winners from the UK included Lidl UK who won the ‘Retail Spirits Buyer of the Year’ and ‘Innovator of the Year’ and the buying team at Marks and Spencer who celebrated a hat-trick winning the ‘Retail Wine Buyer of the Year’ for the third year in a row. 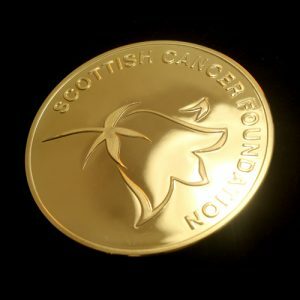 Back in 2015 we worked with Scottish Cancer Foundation to produce a truly significant and memorable award when we produced the annual Scottish Cancer Foundation Prize and Evans Forrest Medal. The inaugural annual prize is presented in recognition of the person who has made the most significant contribution to reducing the burden of cancer in Scotland. That year the Scottish Cancer Foundation Prize and Evans Forrest Medal was presented to Professor Tessa Holyoake. Professor Holyoake was also presented with £10,000 in recognition of her work and to further the research she is doing comparing cancer stem cells with normal cells to identify potential courses of treatment. The research, which is carried out at the Paul Gorman Leukaemia Research Centre at Glasgow University, where she is director, offers hope of new treatments for the condition. We were honoured to have played a small part in rewarding Professor Holyoake with this prestigious award and acknowledging her life-changing research in this field. 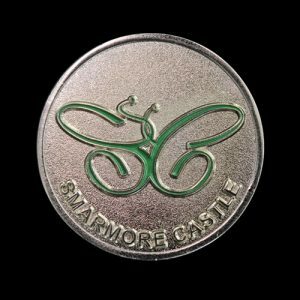 We produced a Commemorative Coin for Smarmore Castle a private clinic that treats alcohol and drug addiction in County Louth, Ireland. The addiction treatment facility was founded by the directors of one of our valued clients, Castle Craig Hospital in Scotland, to help residents achieve a long-lasting recovery through intensive personalised programmes. The hospital approached us to produce a custom made coin that could be awarded as part of their twelve-step philosophy of taking ‘One Day at a Time’. The beautiful silver frosted/polished commemorative coin features the mustard tree symbol which is meaningful because recovery from addiction is said to grow out of a small seed into a great tree. The Smarmore Castle Commemorative Coin has a simple design but a significant message and represents the small step the patients have taken on the process to a new life. This is just a snippet of some of the products we’ve produced for our varied and loyal client base over the years. We’ve loved helping them to make their products a reality and to have played a small part in the lives of those who have been awarded our coins, medals and awards.